Tonight was our first official dinner out for the three of us - Shira, Me and The Little Man. We all did well. The little one was remarkably quiet, and spent most of his time either taking in the scenery or chewing on his funky Sun toy (thanks Jerrie!). 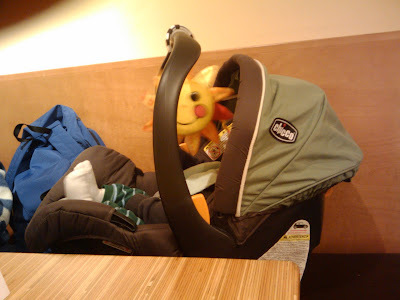 It helps that he's really enjoying the car seat that a friend lent us (thanks Erin!). I love how a trip to Noodles and Company can be considered a real adventure. This parenting thing really does make you appreciate the little things. Yay for chew toys! I bet dinner for 3 was easier than dinner for 4 with the twins. :-) We can't wait to see you and go out...dinner for 8!!! Dinner with the twins was way more fun than this, though, this was a little bit less messy ;-).